Annual herb, erect or with ascending branches, (6) 15–80 (100)cm., simple or branched (especially from the base to about the middle of the stem). Stem stout, subterete to angled, densely furnished with multicellular hairs. Leaves furnished with multicellular hairs along the lower surface of the primary venation and often the lower margins, long-petiolate (petioles up to c. 6 cm., in robust plants not rarely equalling the lamina), lamina ovate to rhomboid -or oblong-ovate, (1) 5–11 × (0.6) 3–6 cm., obtuse to subacute at the mucronulate apex, shortly cuneate to attenuate into the petiole. Flowers in greenish or rarely somewhat pink-suffused, stout, axillary and terminal spikes, which are usually shortly branched to give a lobed appearance, more rarely with longer branches, the terminal inflorescence more or less paniculate, very variable in size, male and female flowers intermixed, the latter generally much more plentiful except sometimes at the apex of the spikes. Bracts and bracteoles lanceolate-subulate, pale-membranous with a prominent green midrib excurrent into a stiff, colourless arista, longer bracteoles subequalling to twice as long as the perianth. Perianth segments 5, those of the male flowers 1.75–2.25 mm., lanceolate-oblong, blunt to subacute, those of the female flowers 2–3 mm., narrowly oblong-spathulate to spathulate, obtuse or emarginate, more or less green-vittate along the midrib, which ceases below the apex or is excurrent in a short mucro. Stigmas 2–3, patent-flexuose or erect, c. 1 mm. Capsule subglobose, c. 2 mm., usually shorter than the perianth, circumcissile, with an indistinct neck, rugose below the lid. Seed black and shining, compressed, c. 1 mm., almost smooth centrally, faintly reticulate around the margins. 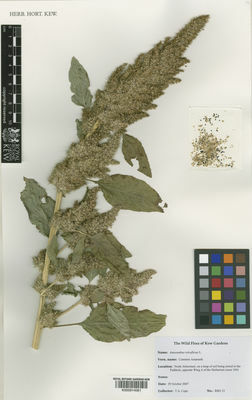 Amaranthus retroflexus var. salicifolius I.M.Johnst. Carmona Pinto, W. & Orsini Velásquez, G. (2010). Sinopsis del subgénero Amaranthus (Amaranthus, Amaranthaceae) en Venezuela Acta botanica Venezuelica 33: 329-356.